Scanty Lardos Pot, Upper Hesleden, Halton Gill (June 2014-). Me, Joe, and Chris had been working on Suntrap Cave and for various reasons hit standstill. It started with a phone call from Chris. Having a tip off from Ken Robinson and Mark Rowley about a hole that had appeared and checking this could be pursued with the landowner, we set off up Littondale. Holes appear regularly throughout the dale, something changes and a clump, barrow or skip-full or whatever’s sat on top can suddenly slump. Something worthwhile sometimes appears. Sometimes doesn’t. This was pretty much about two foot deep with an undercut full of stream cobbles below a small hole leading forwards under the stream bed above. 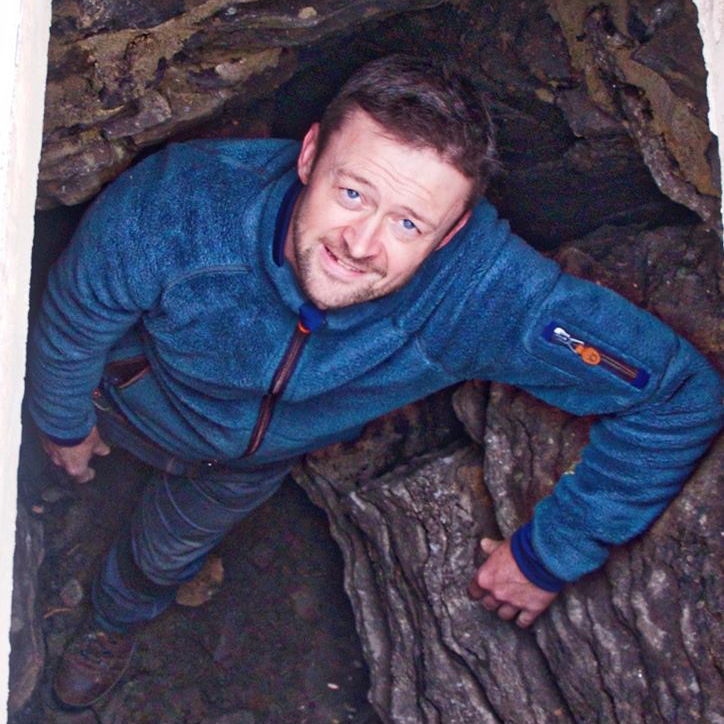 The hole as we found it (Photo – Steve Woods). The hole as we found it on the first day (Photo – Steve Woods). I was new to this. Climbing down to investigate though I knew there was something, I could hear it. Shouting to Chris, ‘is there a plane up there’, the noise in my forward ear captured acoustics that I thought must be outside; a roaring noise. Discounting what I had heard I climbed out. Chris had spotted something else though. Bedrock either side of the hole; a sink he explained. Next thing I knew I was back in digging. Me commencing digging on the first day (Photo – Chris). Sometime later following a bit of progress (Photo – Chris). Heading towards the sound of the noise, stream debris in the background (Photo – Chris). A hole to the right later turning out to be Lardos Rift (Photo – Chris). Chris passed both words of encouragement and further explanation of when and how the hole had filled and words of caution on how the stream fill I was digging out might be sat on something with very little underneath. As my new-to-digging enthusiasm and determination started wane we decided to cover things making sure there was little chance any stock would fall in and investigate the pub instead. We made plans to return and continue whilst the good weather lasted. Packing up after first day’s digging at Scanty (Photo – Chris). Securing the entrance after the first day’s digging (Photo – Chris). Several days of digging elapsed with us now armed with more kit to make a temporary entrance cover; continuing to excavate the hole in earnest. Chris now at the front digging and me hauling buckets things started to progress. We were joined by Joe and the dig continued; Joe building an impressive dry stone, which remains exactly in place today, still underpinning the stream bed. Then the weather broke. The entrance changes dramatically between periods of drought when the stream bed drys up, and periods of rain when it flows anywhere near or past. Turning up with just Joe we decided to carry on regardless. The way in now resembling a washing machine somewhere between rinse and spin cycle. A theme for subsequent parts of the dig started to emerge. Forwards of the water both sinking down the hole and forcing its way out of beddings in the wall, Joe and I decided instead of continuing forward to excavate right following the stream into a rift. Having excavated downward we followed this and hit a cross joint turning sharp left and heading forwards again. My eagerness to see what lay round the corner now got the better of me. Helmet off pushed infront I crawled forward and down. Looking round the corner I got a photo on my phone, confident I could reverse. Ready to go though everything stopped. I couldn’t move at all. Multiple options followed new thoughts. Time stopped. A thought pattern somehow connected a mis-mash of Watto’s advice for all occasions, with my fellow digger top-side (Watto-Jnr). Joe pulling one arm and one leg significantly and me inching up at the same time leading to a lesson well learned and an exit. Me inspecting the newly arrived stream (Photo – Joe Parsons). Scanty entrance in wet conditions (Photo – Steve Woods). First view into Monsoon Chamber (Photo – Steve Woods). As the weather worsened our initial efforts to stabilise and protect the entrance plus further work undertaken with help from Andy Cole and John Wootton paid off. The digging moved into September. As work took me away from the dig Joe and Chris continued to make progress and ‘Lardos Rift’ led them into a sizeable but suprisingly damp chamber below, where the roaring noise continued now leading them back 180 deg from our staring point above. Paul Smith, Caddy & Lido helped them. Back at the dig weeks later, joining Chris in said chamber, with water pouring out of every available orifice, we continued to work at enlarging the way on with Phil Parker joining us and Chris Smith largely taking over the bulk of the enlarging. What followed took considerable time, the shale bed in front refusing to give up. Chris and me with 110v widening kit (Photo – Phil Parker). Chris & Phil Parker in Monsoon Chamber during heavy duty widening (Photo – Steve Woods). With the hole to me looking big enough, and with Chris holding my legs, my helmet held in front of me I crawled forwards, Chris Smith, Phil Parker and Joe in the background murmuring what was later was explained to me in the pub as, ‘he’s going to drop that’. Through with nothing but space below me, panic replaced eagerness and scrambling for a hold the helmet disappeared off downwards, clattering against the walls as it went. 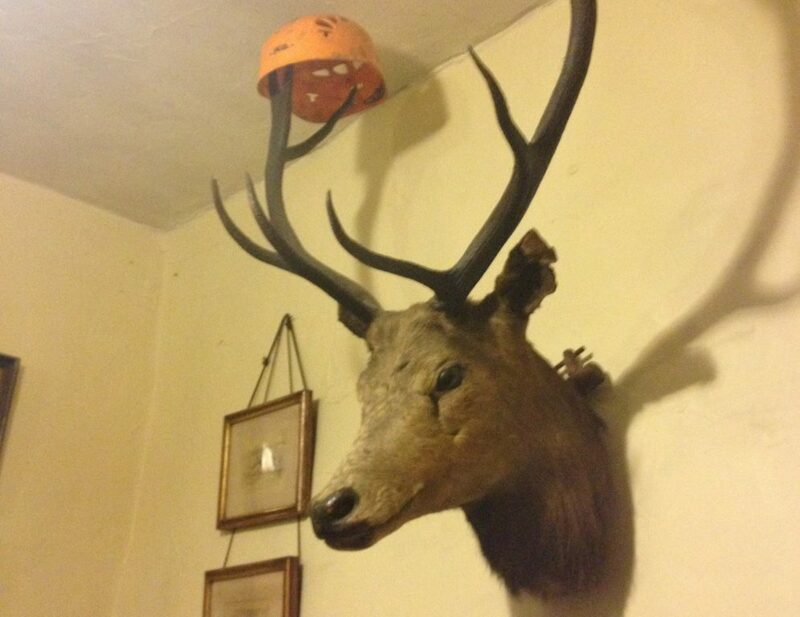 Ahead of me that roaring noise now competing with the noise behind of the gang including Chris, who had neglected to keep hold of my legs, busy roaring with laughter; said helmet weeks later, now retrieved and installed in the pub, becoming a prompt for subsequent ongoing amusement. Chris, Joe and Chris Smith largely took over at this point with me finding little free time. Another phone call from Chris with instructions to me to make time found me heading back up-dale. Chris and Joe had reached the bottom of the pitch and found open passage. Misery pitch takes considerable water. This had taken considerable work. The project had stopped and waited for me. How many folk would Do that? Chris waiting topside in the pub for news, Joe and I setting off into glorious streamway, thoughout which in the back of my mind I kept thinking would end abruptly any moment. Only the streamway led us on and on eventually reaching a noise where the floor ended replaced by blackness and empty space. What lay beyond our previous trip now rightfully promised to Chris, weeks later we were joined by Nigel Easton, Paul Smith, John Wootton and Watto. In his eagerness though, arriving late, I found the gang detained in a section of cave Chris was now finding necessary to widen to progress, leaving the rest of us occupied with similar merriment that had followed months earlier at my expense far above in Monsoon Chamber. A discussion followed and with Watto heading out and Chris unable to progress the rest of us continued forward to the head of Joe’s pitch. With the approach rigged and Joe needing to head off John Wootton set off down with me following. In the booming noise of the significant stream dropping the pitch and running out of rope John had connected a second rope to reach the bottom. Passing the knot in the spray soon forgotten, we reached the bottom and headed off into a rift to the right soon finding a third pitch. We turned round and deciding to head out having at this point run out of rope. My ability to take part in the project at this point took a short break for a number of reasons. Work continued however and first John Wooton and then Joe and Chris Smith joined by Andy Cole and Nigel finally reaching the foot of the final pitch to be greated by a spectacularly decorated Aven and a boulder choke stopping all further progress. Nigel in the main streamway (Photo – Andy Cole). Andy Cole in Ann Summers’ Passage (Photo – Nigel Easton). Chris Smith at the top of the 3rd pitch (Photo – Nigel Easton). Joe at the top of the 3rd pitch (Photo – Nigel Easton). It then took the best part of 18 months for me to rejoin the project and reach this end point. My memories of this trip stay with me clearly to this day. The boulder choke is a significant obstacle and many have tried to find a way beyond this. Richard Bendall bolted half way up the Aven so that he Joe and I could explore a lead which ended in a blank wall. We returned and again Richard led us this time to the top of the Aven to try to find a way over but none was found. Ian Cummins and Simon Beck attempted to find a way through further down and many trips followed but having explored every possible option no way forward was found. In the end we returned to pursuing the stream which disappears under what is a massive collection of boulders glued together by calcite, suggestion, thin air, and imagination. I’ve been joined here by Joe, Richard and his mate Darren, Andy, Mick Ellerton, Nigel, Denis, Fay, Andy Chapman, John Helm, Adele and many others. At Richard’s instigation Simon Cornhill and Di Arthurs successfully surveyed the cave and thanks go to Phil Ryder for drawing up the finished version which is included here. With progress below stalled concern for the the active stream-way collapsing the entrance, focus temporarily switched. I joined Steve Warren, Hucky and Katie and together much of the original entrance structure was removed, Hucky returned with Wiz and together with many assistants they fabricated the current entrance; a testament to their considerable talents. Hucky, Steve Warren and Katie disassembling the temporary entrance (Photo – Steve Woods). Nigel taking a break and Wiz busy with internal walling of the new entrance (Photo – Steve Woods). Hucky and Wiz’s and their assistants finished entrance walling (Photo – Steve Woods). Hucky and Katie installing shuttering making ready for the reinforced concrete entrance cover (Photo – Steve Woods). Wiz completing finishing touches to the concreted entrance (Photo – Steve Woods). Chris checking out the finished new entrance (Photo – Steve Woods). A very large number of people have been involved in the project and I hope I have included them all in this account. It has been difficult to emphasise here the number of trips and effort that has gone into getting this ongoing project to where it currently stands. Everyone mentioned has had a considerable role in this. Chris has been central to the project throughout. Without him, it would never have started nor would it have reached its current point. We were also incredibly fortunate towards the start to have met the new and current landowner and his family by chance one evening. Their continued friendship and support throughout is for me one of the most important aspects of everything described. Weather permitting we continue to return to this project and make slow progress in the final boulder choke. ‘The office’ though remains a formidable obstacle. Not a place to hang about. Having witnessed at least three occasions where dramatic collapses have resulted in all present being seriously lucky, Scanty remains a place reluctant to give up further secrets lightly. 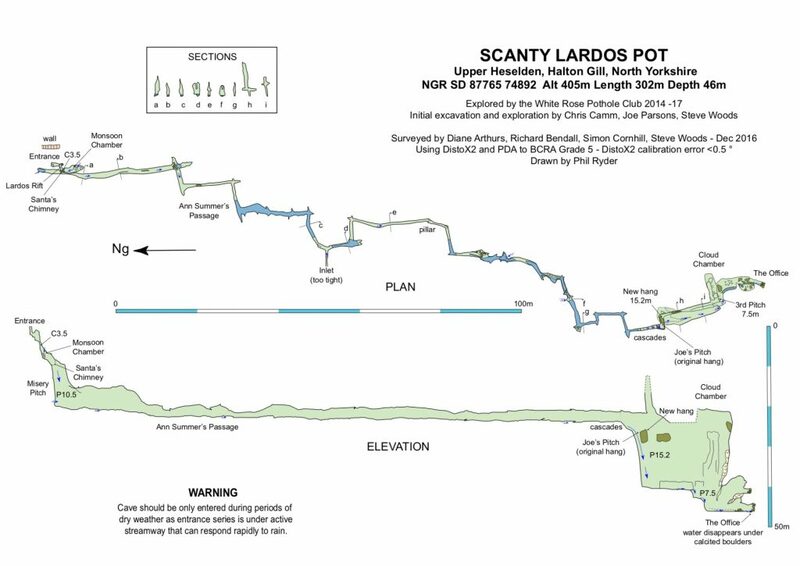 The full Survey of Scanty Lardos Pot is available here. For more info about this project please feel free to contact us. Scanty Lardos Pot remains an ongoing project. The entrance is in an active stream and will become impassable in wet weather. The final boulder choke is very unstable and should be treated with the utmost respect.